How common is it to have a rabbit that comes to you for cuddles when they're tired? Or wants to hop on and off of you for fun verses going off on their own exploring? Or when they do go off a little on their own, binkying all around they stay right out in the open vs going exploring behind a couch or under a table? And if they see you walk by they follow you around wanting attention? Beg to be let out of their cage and when you let them out they run right to you? I have had so many bunnies but never ever one so dog like. Even all of her siblings when brought inside will only say hi for a second then they go off on their own..
Of all the bunnies we have had, only the velveteen lops were consistently people-loving things. Mucky still loves being pet, and reciprocates by grooming me in return. The harlequins are a close second however. My daily rabbitry routine involves opening the cages one by one and giving kisses and petting to every bun who hangs their head out to greet me. (The petting doubles as a way to check overall condition.) I can expect any hand that enters a pen with 2-7 week old harlequins to get a thorough licking. Here is an older pic of Sushi, passed out on my lap. So in your experience a velveteen is more people friendly than a holland or mini? I cant remember what i had as a kid, i think holland and up until peepers it was the sweetest & calmest. I was already trying to litter train peeps because we had planned for her to be a forever indoor & hopefully cageless bun. What do the velveteens feel like? Is their fur similar to a mini rex? How i wish one of my buns would lay on my lap right now.. your sushi is beautiful!! Most of our buns will present themselves for petting but HATE being picked up and held..
Velveteens lops do have a rex coat, but their personality tends more towards english lop than a holland or mini. English lops have a reputation for being one of the most docile rabbit breeds. I still pen up my house buns though, as it only takes one little nip to destroy a wire, and we have them all over the place from having more PC's than people. Yeah we are pretty wire heavy around here too. My favorite rabbit personality-wise is my Himalayan buck. He follows me around, comes when I call, will wear stuff (leashes, hats, shirts) happily, will go back to his shed on command and wait there, will jump back into his cage for me, will get up on my lap, play dead (eyes open, head and body on side, while I pet his cheek or paws). He does agility too - I never trained him, he just did it - and he is scared of nothing. On 4th of July night, he was doing binkies in my yard about 50 feet from fireworks going off loud enough to startle even me. He does bite though, so there is that. I also think it depends on how much they were handled when young. My sister has a super tame small breed mix, that would appear to have angora or jersey woolly ancestry. he follows her, hops into her lap, licks her, gets excited when you walk by his cage, does tricks, wears clothes, cuddles, and all that. I am sure my others would have done that if we handled them nonstop. They might still. My sister has had her rabbit since 6 weeks and handles him for hours a day. She just lets him run in her room with her or sits in her lap when she is doing school, watching TV, etc. 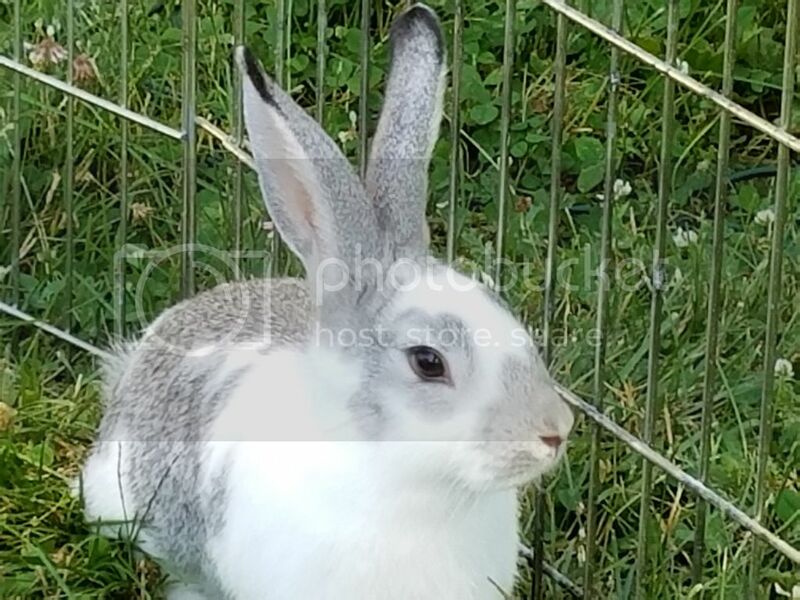 If you wanted a rabbit like that, whichever breed you choose, find a breeder that handles them from very young, and pick one that appears very friendly. Then handle it a lot. Feed it treats. let it be around the house a lot. I wouldn't suggest a Netherland though, they can be nasty. And I had an NZ/Cali before who was not exceptionally friendly. While i do think it helpa when they are held at young ages i know for a fact that theres more to it than that. Nibbler one of my does was born inside (before i finished my rabbit hutches) and she was held by everyone for hours at a time, even before her eyes were open. She was everyone's favorite. My 17 year old neice and i used to playfully argue as to whos bunny she was. She didnt go outside in her hutch until about 8 weeks. We also kept another doe, Sylvia from the same litter. We liked her a lot, but she wasnt held even 1/4 as Nibbler. Whenever i go out to the hutches, Sylvia presents herself to be petted. Nibbler avoids human contact like the plague! Sad too because shes gorgeous. This is Nibbler.. i think shes a chinchilla or squirrel? 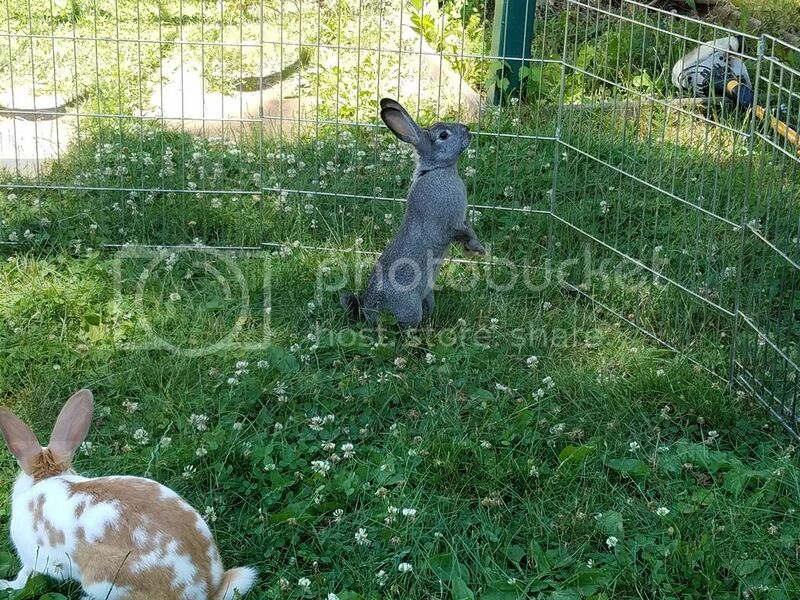 My rabbit Olaf has a huge personality. To me personalities of my pets are very important. When I get a new small pet I make sure I take time to study his/her personality. A personality makes a pet. Olaf is so sweet, kind, and very curios, funny, and full of energy! Since he is an outdoor rabbit, to give him exercise and time out of his cage, I let him free in my bedroom. He will dash around the room doing binkys the whole time! Then he gets tired and lays down beside or near me. Then after his little rest he bounces back up. Olaf will hop into my lap for pets and lick my chin and nose. What are some of your pets personalities? I think it is all down to how much they were handled as kits. Truffles is super friendly and very much a people rabbit. She will beg for attention and even lets me pet her stomach when she is laying down. Of course, breeds that are known for being kid-friendly (like hollands, mini rexes, and dutches) tend to be more people-friendly, too. bunnychild wrote: I think it is all down to how much they were handled as kits. I don't think so. Although it makes a huge difference if handled or not, their personalities are genetical. I treat every litter the same way -and every rabbit has it's own personality.Every one in each litter can range from skittish "DONT TOUCH ME" to "that car(/dog/cat..) is no match for me!" A good pet character is something that is bred, sure, every bunny has charakter and you gotta love it, but things like being comfortable with being handled are bred in traits. I got two of my New Zealand Whites from the same breeder. He didn't focus on personality as much as meat production. The doe is standoffish and prefers to hang out in her cage over being let out in the rabbit tractor;she'll check out the area then set herself down in a corner until it's time to go back into her cage. The buck will run around binkying, demand petting, and follow people around whenever he sees one. I pretty much just chalked it up to the fact that all critters have their own personality. This is Zookie at about three weeks old. He has to run to see you as soon as the door opens. He's the smallest one in the litter and the most curious and the one most likely to binky. If you don't do what he wants, he gets all sassy and sticks out his tongue, among other things. He's only four weeks old, it's gotta be nature more than nurture. Although he's been handled since he was about four minutes old. He's an English angora, he will probably go to a wooler home and be someone's micro-sheep and provide fiber and amusement. He is adorable. I have an english lop that I breed with a giant chinchilla buck. She only had one kit and he is the sweetest boy ever. He was raised with a litter of standard rex and has received the same amount of attention as all the other kits. He is way more friendly than any of them so genetics definitely plays a role. Also what the other posters were saying about velveteen lops is so true. I have a breeding pair and they will chase me down for attention. I can not sit down around them with out them in my lap. Sometimes it is too much! Maybe the breeder she came from handled her a lot as a kit but I don't know because I got her at the state fair.